Added two more books to my library for this trip. 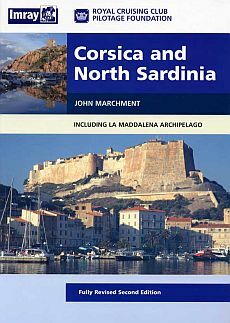 The pilot for Corsica and North Sardinia and the Rough Guide to Sardinia. First impressions: the Maddelena Archipelago will be beautiful and I hope we can make the crossing to Corsica from Sardinia as Bonifacio looks as a place not to be missed. This entry was posted in Sailing Italy and tagged Appetizer, Bonifacio, Italy, Maddelena Archipelago, Movie, Sailing, Sardegna, Sardinia on May 30, 2010 by ancientcoasts. One of the better races of the Netherlands, was held this weekend in Scheveningen. The Delta Lloyd North Sea Regatta 2010, a three day sailing event along the coast of the North Sea. I was invited to participate the first races on GfK, a Beneteau First of 40.7 foot. The weather conditions Friday were light, northern wind of around 10-15 knots. Around 13:00 the races started in two shifts. It was quite a straight parcours in line with the wind direction. It had a bouy with a spreader in the North and a Gate in the South. Boats were going up and down along the same rhumbline, you just had to be careful not getting sandwiched. Unfortunately the weather conditions changed to the worse. The second race was cancelled due to fog and we had to return to the harbour. We were not the only ones there. For the record, we finished second in our class (ORC-1) that day, just 32 seconds (on 1,5 hours) behind the overall winner of the NSR 2010. This entry was posted in Sailing and tagged Beneteau First, Gfk, North Sea Regatta, Race, Sailing on May 23, 2010 by ancientcoasts. What to say about a classic designed Swan from 1979, the lean and mean racing machine? First thing is that such a classic racing boat certainly has a charm you feel directly. The very spartan interior doesn’t change the instant affection for the boat, not to mention the sailing. Cool to be on such a boat during the race for La Ruta de la Sal. Everyone focused on speed and speed only. A slight change in wind and everyone was running to change the sail for the newborn circumstances. Yelling heist, heist, heist and the Genua 3 was changed into a Genua 4 in less then a minute. Lot of sails and lines on a racing boat although. Could still prefer a good old cruising boat for sailing the Ancient Coasts. Below my impression of Sailing Yacht Colombe. This entry was posted in Sailing and tagged Barcelona, Ibiza, Mediterranean Sea, Middle Sea, Ruta de la Sal, Sailing, spain, Swan 441 R on May 12, 2010 by ancientcoasts.